The perception of beauty has been significantly distorted by cosmetic companies promoting flawless bodies and perfect figures. However, things are never perfect in real life. Many people are born with genetic disorders that make them unfit according to conventional beauty standards. Some find this depressing, others rise to the challenge and show the world that beauty can’t be objectified. This post is dedicated to the later category. Listed up in this post are photos of over 23 models who accept their genetic disorders as a part of themselves and they look and feel beautiful being who they are! Ilka says, "I think EVERYBODY is beautiful in her or his own way," writes 26-year-old German model Ilka Brühl. "There is only one way to be ugly: by having an ugly character." Ilka was born with ectodermal dysplasia. It's a rare genetic disorder that gave her a facial cleft and irregularity with her ears. Sophia has taken over Instagram by a storm with her thick unibrows. She was first scouted by Italia Vogue aged 15. However, her main source of fame was a string of selfies that reached more than a million people and got appreciation. Dru Presta suffers from Dwarfism and is only about 1 meter tall. Through her childhood, she was bullied for her condition called achondroplasia. Her move to LA proved vital as she got her big break in the modeling industry, resulting in never-ending success. “I want everybody in the fashion world just to be accepted,” said Dru. Having a bald head, gapped teeth and a lot of teeth isn't the ideal appearance for a fashion model you'd think. Yet, Simone Thompson is breaking barriers being an integral part of the Instagram modeling scene. She has ignored all her weaknesses to achieve much more than her peers. Ashley was just 12 when she found out she'll have to live with vitiligo all her life. She absorbs all the negative energy from her school days and converted it into motivation that led to her success in the future. Mekhi Alante Lucky, who recently walked at a Philipp Plein show, is notable for his one blue eye and one brown eye, the mesmerizing result of a medical condition called heterochromiairidum. Diandra is the first ever African-American model with albinism that signed with a Top of the league modeling agency. Her unique beauty has struck many minds. She has rocked the ramp at multiple occasions now. Winnie Harlow, 24, is a Canadian model who also spreads public awareness about vitiligo. Her highest point came when she was selected as a contestant in America's Next Top Model due to her irregular skin condition. Arina believes in carrying her flaws as unique superpowers. Moreover, Arina wants to inspire teenage girls with nonstandard faces all over the world. This is the reason why Arina doesn’t try to hide her big ears and confidently poses for famous magazines. Standing tall at 5'10", and 218 pounds, Tabria is a plus sized model who is giving major body goals to all of us. She's a motivation to women suffering from anxiety regarding their weight. "I grew up always seeing the Sports Illustrated Swimsuit Issue, but I never dreamed I'd be in it because I never saw anybody who looked like me in it," Majors said. Shaun Ross is a 22-year-old model. He has suffered from albinism since he was born, which stops the skin cells from producing pigment. The effects can also be seen in his hair and eyes. Melanie is a model from the USA who suffers from a medical condition called ectodermal dysplasia. She's yet to get a modeling contract but her unique abilities shall soon take her to greater heights. She's a model from Great Britain who grew excessive facial hair due to hormonal imbalances. However, that didn't stop her from achieving all she has. Harnaam Kaur is an inspiration for all because of the way she overcame her years of getting bullied and self-doubt. This South African sensation was born with vitiligo but he didn't let it stop him from achieving his life goals. Moostapha's unusual skin tone interested many photographers in signing contracts with him. Kanya was born in Pak Chong, Thailand without legs. She was abandoned on the front steps of a Buddhist temple when she was only one week old. She has transformed her life and inspired many on the way by becoming an athlete and a Lingerie Model. Sara Geurts is a Korean model who's 27 and suffers from a disease called Ehlers-Dablos syndrome a.k.a EDS. This syndrome affects her body in multiple ways, including wrinkled and saggy skin. Tsunaina is a model from Tibet who has won many hearts because of her Avatar like skin condition. A modeling agency decided to take a chance with her appearance which paid off. She's done multiple campaigns with Christian Dior now. Haider from London initially got fame when he was featured by Brock Elbank in his famous photo series named "Vitiligo". The purpose of the photo series was to depict the beauty in diseases like the one Haider possesses. Joyjah from Belize is 22 years old. She recently got success, getting featured in UK's LOVE magazine as one of their lead faces. She has relocated to London to follow her modeling dream and the fashion world can't stop discussing her perfect hair. The "Melanin Goddess" is the second name given to Khoudia. 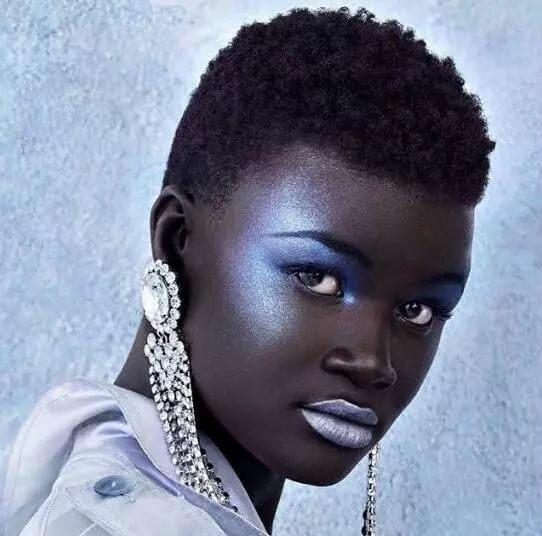 This model from Senegal was once bullied for having skin so dark. She became part of a famous online campaign called "The Colored Girl", which helped her showcase her talents. Maeva Giani Marshall is a French-American model with hyperpigmentation, leading to a collection of freckles around her eyes and cheeks. Now signed with Heroes Models, Marshall stands for the beauty of diversity in the fashion world. Moffy Gathorme Hardy is a super-model having crossed eyes. She recently signed for Storm models, the agency that signed Kate Moss. She's been breaking stereotypes and with her gorgeousness.